Clear shadow-in sky under darkening conditions at over 0.9 eclipse magnitude (look on the left, where sky appears to be darker). The illuminance level and sky brightness are very important elements of solar eclipse phenomena, because both are clearly noticeable by observer along with his eye adaptation. When the eclipse phase is deep and turning into totality, the light level changes drastically, much quicker than in any other ocassion. It makes the solar eclipse one of the most notable phenomena exhibited on the sky. This article presents some studies about illuminance and sky brightness changes during the solar eclipse. These studies come from various solar eclipses and have been combined with my private measurements taken during 2017 solar eclipse in Wyoming. I am going to give an answer how exactly the illumination circumstances changes throughout the solar eclipse and what determines them. The illuminance level during the solar eclipse can be measured with Lux units (Lx). Read more about it in my previous article, where I shown a basic relationship between the units of light and some ways to measure the light level. Measuring the light level in Lx we can compare our result with the light from the outdoor and indoor recommended light levels given. Moreover the light level changes during the eclipse allow us to compare them with moments of particular solar distance against horizon, which determines a various level of illuminance on daily basis. Light level during the eclipse can be measured with Lux Meter. This typical equipment allow us to record the illuminance changes in Lux units. 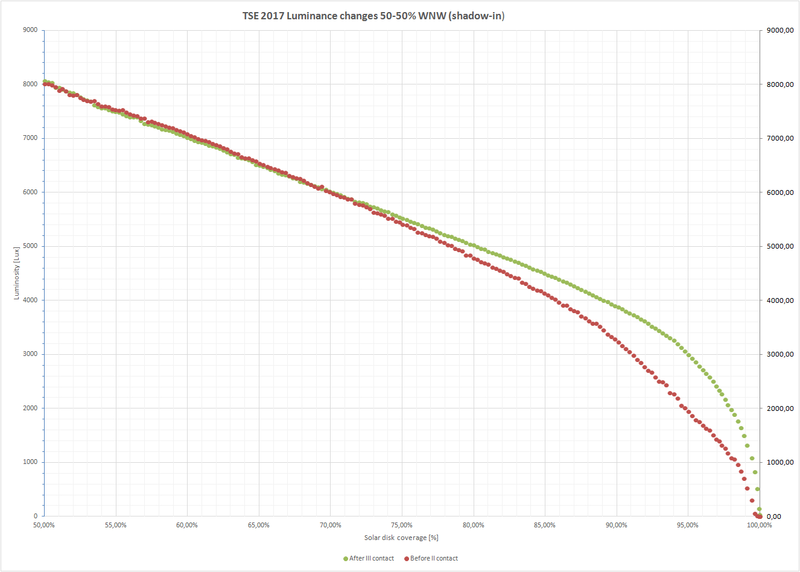 Some observers like Wolfgang Strickling in his solar eclipse measurements use the TSL230 programmable light-to-frequency converter. This instrument converts light intensity to a frequency both at day and night. The accuracy of this instrument can balance +- 20%. Aside for the professional instruments the light level can be measured on amateur way with use the mobile apps. This option is good only for orientation with light level changes and weather factors making them. Usually deviation of mobile phone measurements makes too big discrepancy between a real light level value and value given. 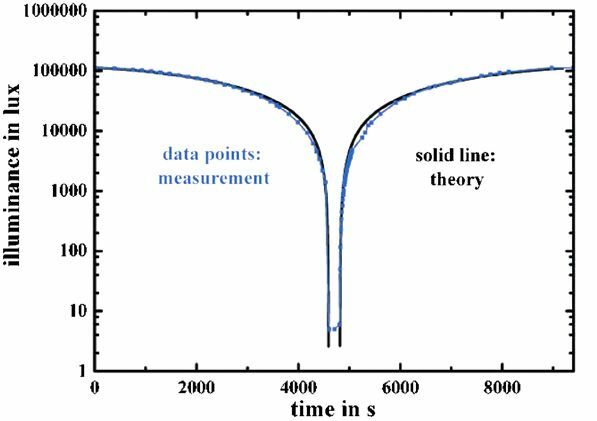 I described more about light level measurement tools in this article. I am the astronomer amateur and my measurements were also amateur despite I was trying to make my eclipse observation as much professional as possible. Nevertheless without decent instruments I cannot assure, that my results are reliable enough. On the other side I did everything to record how the light level behaves during the eclipse and I am pretty sure, that all factors during my amateur measurements have been covered correctly. For the purpose of light level measurements I used the Eclipse Droid – the Wolfgang’s Strickling android app (Pic. 1, 2), which perfectly fit to these purposes. The interface of this astronomic app is very friendly. It computes your local circumstances for solar eclipses in wide time range throughout XXI st century. The app itself is multifunctial. The details of the Eclipse Droid you can find here. 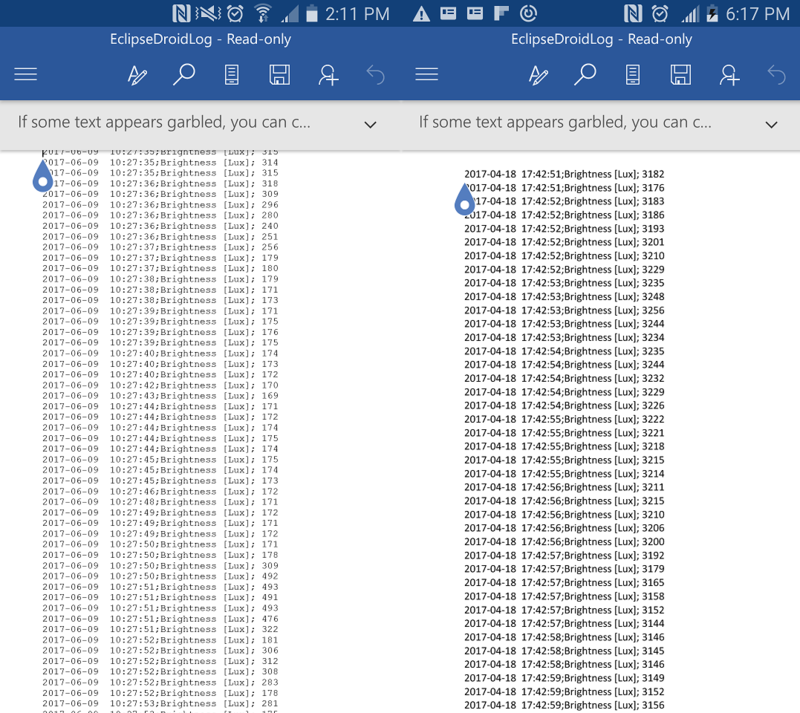 For my purposes I used the eclipse real-time simulation and the Lux Meter built-in, which in conjunction with MS Word for Android could record detailed log regardless of the time frame. Eventually I have got a several hundreds pages of light level log from the Great American Eclipse. Pic. 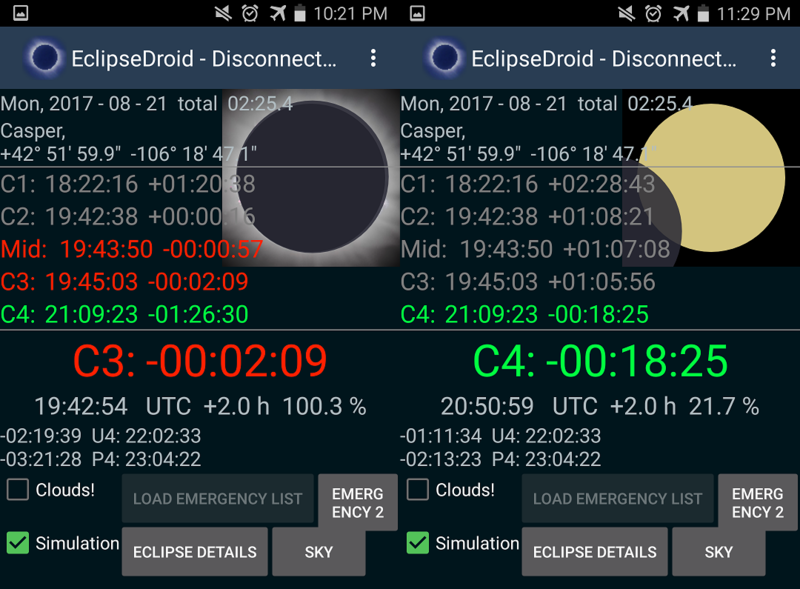 1 The Eclipse Droid Android app used in light level measurements during the 2017 total solar eclipse in Wyoming. Pic. 2 The Eclipse Droid light measurement log, automatically saved as a .doc file. The illuminance level during the solar eclipse is one of the elements comprising on whole atmosphere response phenomena during the solar eclipse. There at least a few studies, where the light level measurements were conducted. In terms of the illuminance level during the eclipse also solar radiation is typical element to study about. I will focus on methods of illumination level during the solar eclipse, which I made as an amateur during the Great American Eclipse. Before I do this I would like to bring some information about another light level measurements taking during the solar eclipse. The study about the light level changes during the eclipse must be associated with important assumptions, where the Sun and Moon are perfect spheres and effects of sunspots and prominences are neglected (Lee, 2012). Some authors took into account the influence of aerosol in the atmosphere, where a standard aerosol model was assumed (Shettle, 1989)(Emde, Mayer, 2007). – Partial solar eclipse with solar center uncovered, where the limb darkening impact is the lowest. A right edge of the Sun is obscured but the btrightes center is still present. Light level doesn’t drop rapidly. – Partial solar eclipse with solar center covered where the limb darkening plays a leading role in illuminance level changes. It contribution increases evenly with obscuration. 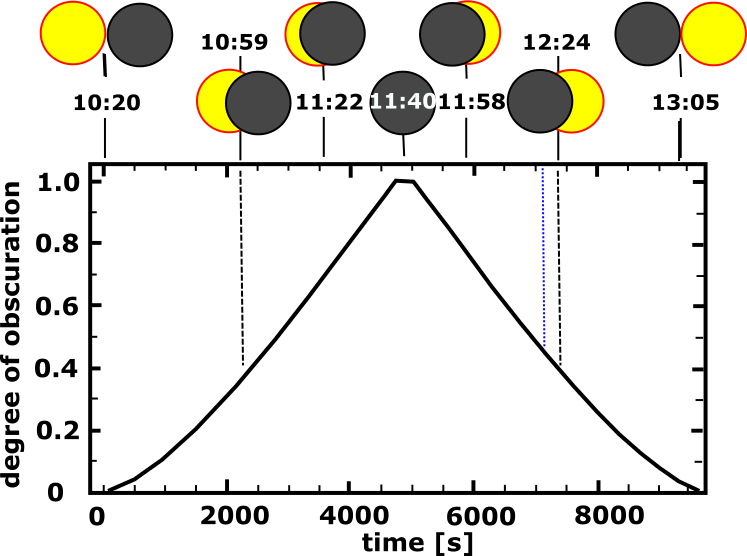 Basically the solar eclipse measurements can be divided into three time intervals; during the first one, the Moon starts to cover the Sun; during the second one the Sun is completely hidden behind the Moon, and finally during the third one, the Moon gradually uncovers the Sun (Lee, 2012). All publications and amateur light level change measurements during the solar eclipse has been focused on solar direction only. Analyzing these measurements depicted on charts we can see more or less symetrical shape of illumination changes (Pic.3). This gully-looking shape refers to the whole eclipse phenomena and is presented in logarithmic scale. It refers to all light level measurements carried out around mid-daytime hours, another can look slightly different due to solar position above the horizon throughout the eclipse window. These observation models can slightly differ from each other, because in some of them the limb darkening has been omitted and Sun’s disk was assumed to have homogeneous luminosity (Mollman, Vollmer, 2006)(Pic. 6). In other cases the Sun was hidden by clouds making a different observation chart in the result. Pic. 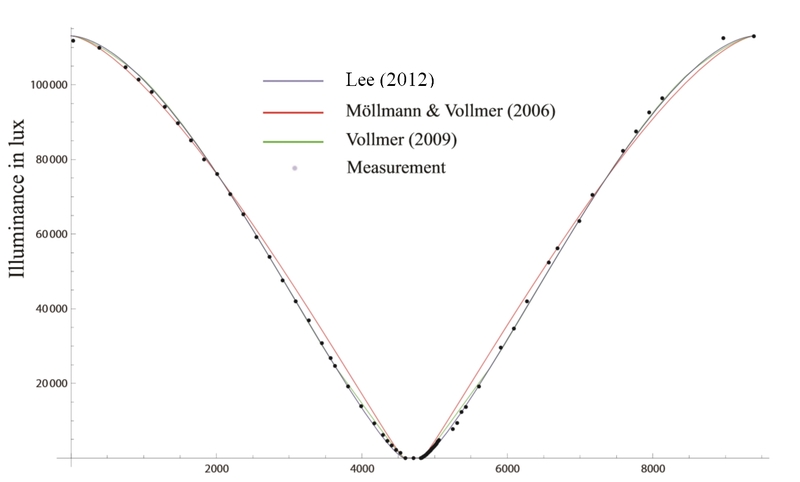 3 Illuminance measurements during the solar eclipse comparison between 3 different models (Lee, 2012). Pic. 4 Normalized illuminance level model for total solar eclipses as proposed by Mollmann & Vollmer, 2006. The illuminance level of direct sunlight varies strongly, depending for optical properties of air mass and possible cloudiness. Therefore the theoretical line of illumination changes usually differs from real measurements taken on site (Pic. 5). Sometimes the illuminance given by direct sunlight can reach about 70000 Lx only (which is a typical lower limit for zenithal Sun), whereas outside of the atmosphere it can be even 140000 Lx (Mollmann, Vollmer, 2006). Pic. 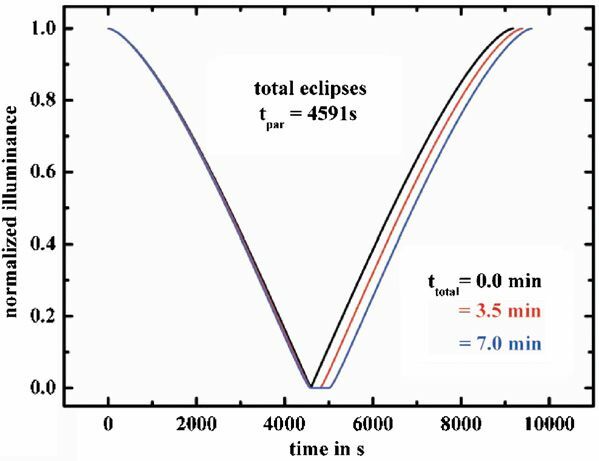 5 A difference in eclipse model of illuminance level between a theoretical assesments and measurements taken during 2006 total solar eclipse in Turkey (Mollmann, Vollmer, 2006). In general, the illuminance level is proportional to the unobscured area of the disk of the Sun (Pic. 6) (Mollmann, Vollmer, 2006). However it happens theoretically only, because as we know from above, an important factor is the limb darkening, that modifies this assumption slightly. Pic. 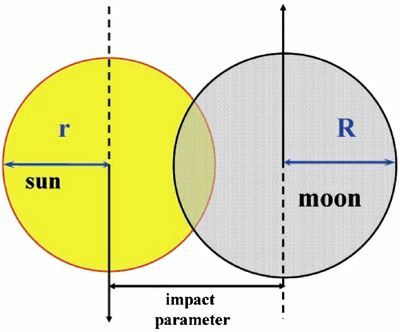 6 Solar eclipse model as proposed by Mollmann & Vollmer, 2006. The issues above has been raised in terms of the direct sunlight illumination measurements towards the Sun only. There is no illuminance measurements taken in other direction than solar. Only in Wolfgang Strickling light measurement chart from Indonesia I can guess that he set his instrument towards shadow-in direction (Pic. 7). Pic. 7 Weather measurements taken by Wolfgang Strickling at the total solar eclipse in 2016 in Indonesia. 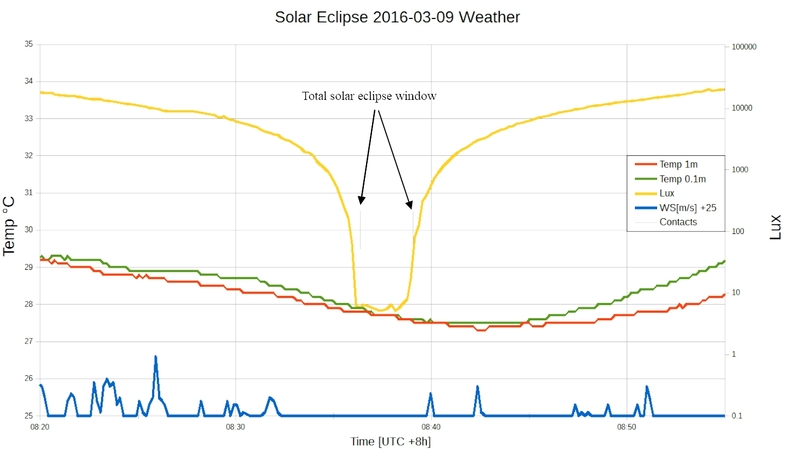 Yellow line represents a light level changes, which remain asymmetrical against the totality window (Strickling.net). Making a observation of illuminance level outside of the solar direction was my basic goal during the 2017 Great American Eclipse. I set my smartphones in 2 directions bearing them at around 45 deg angle (Pic. 8). – WNW, from where umbra was approaching (shadow-in). It was a view nearly onto antisolar point with initially one of the darkest section of sky. – ESE, oposite direction, where umbra receded (shadow-out). This direction was in less than 90 deg angular distance to the Sun with one of the brightest section of sky. Pic. 8 A directions of my illumination level measurements during the 2017 Great American Eclipse as shown on the sky sphere pattern, against the position of the Sun and umbral movement. My measurements was carried out from 1st contact to around 50% obscuration during 2nd partial phase (Pic. 9). Pic. 9 Total solar eclipse 2017 timing for the Polish Society of Amateur Astronomers (PTMA) observation venue. A blue dotted line shows my illuminance measurements termination at 12:16 UTC-7 and 48% obscuration. As I mentioned above I recorded the light level changes in 2 non-solar directions: shadow-in and shadow-out (Pic. 8). These directions are very important when both total or deep partial solar eclipse occurs. Then we can observe darkening sky in the shadow-in or shadow-out direction (or path of totality direction when partial eclipse only occurs). Shadow in direction – the WNW section of sky was initially one of the darkest part of the sky due to long angular distance to Sun (read more here). 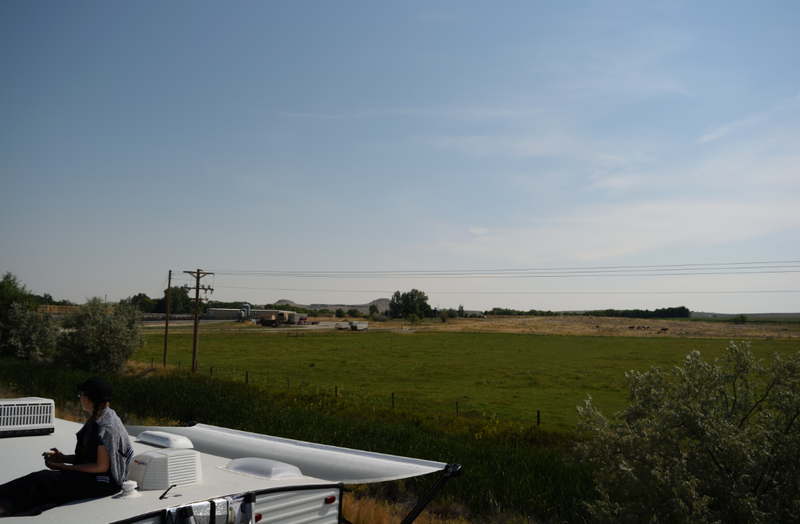 Despite a high haze level on the eclipse day the north-western sky was navy blue with around 9500 Lx initial value given. There were patchy cirrostratus clouds in this section of sky lifting up the iluminance level locally (Pic. 10). This is normal, when a non-cohesive light scattering plays a role in the atmosphere, as detailed in this article. Anyway these clouds interfered into around 1/3 of partial phase, what shows a jagged line on the chart (Pic. 11,12). Pic. 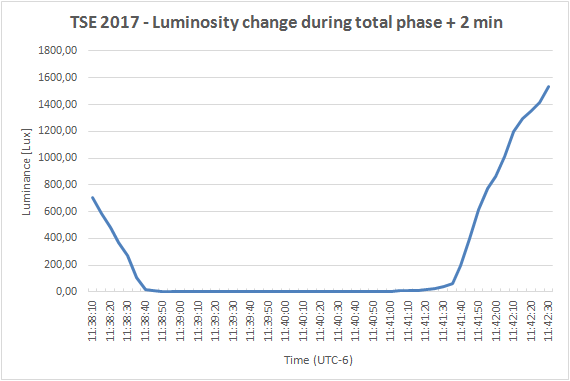 11 Overall luminosity changes towards the shadow-in direction during the 2017 Greatest American Eclipse with jagged part, where cloudiness was present. Click to enlarge. Pic. 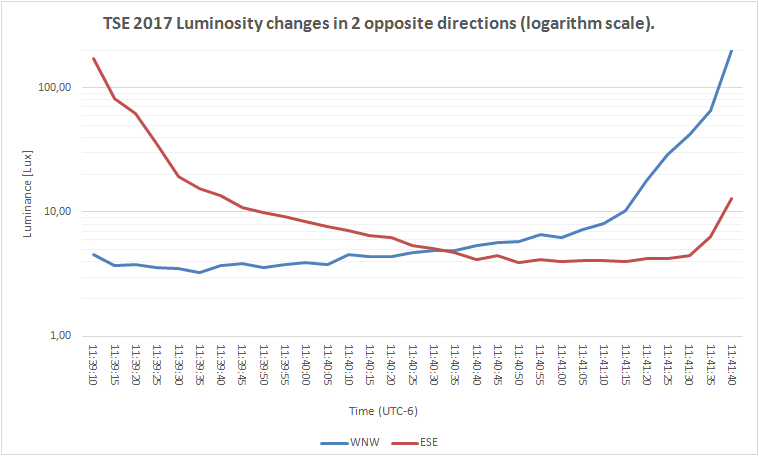 12 Overall luminosity changes towards the WNW (shadow-in) direction during the 2017 Greatest American Eclipse in logarithmic scale. See an original image here. As the Moon started to cover more and more of the solar disk these clouds moved southwards giving completely clear blue sky (at least within the measurement frame) around 45 min after 1st contact (Pic. 14). Pic. 13. About 11:10 (UTC-6) clouds moved southward, giving a way to clear, blue sky. Click to enlarge. Pic. 14. Clear shadow-in sky under darkening conditions at over 0.9 eclipse magnitude (look on the left, where sky appears to be darker). Click to enlarge. 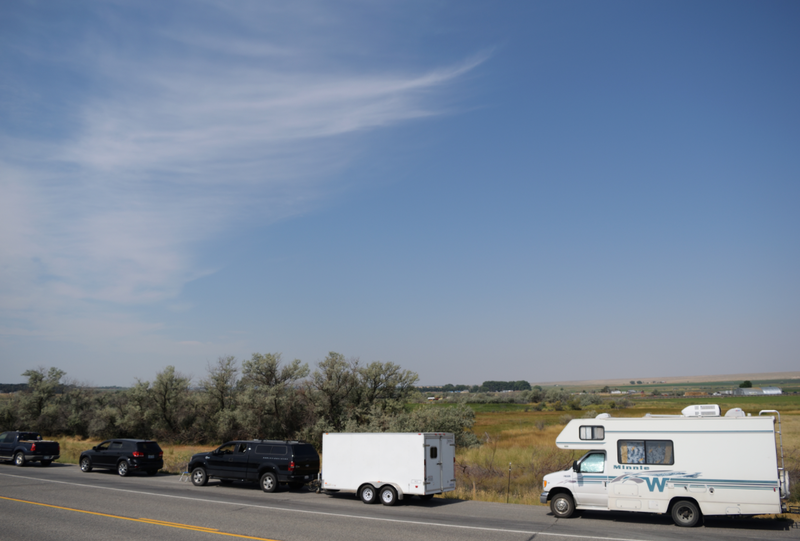 10:20 – 10:50 – Cirrostratus clouds were prevailing on the observation frame giving not stable value of sky illumination ranging between 9200 and 9900 Lx with a faint drop impossible to notice by human eye. 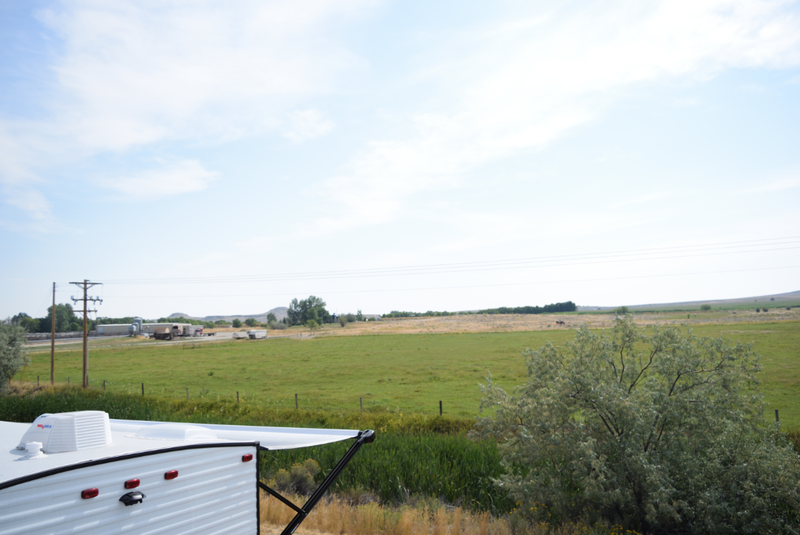 10:50 – 11:10 – Cirrostratus clouds were more patchy. 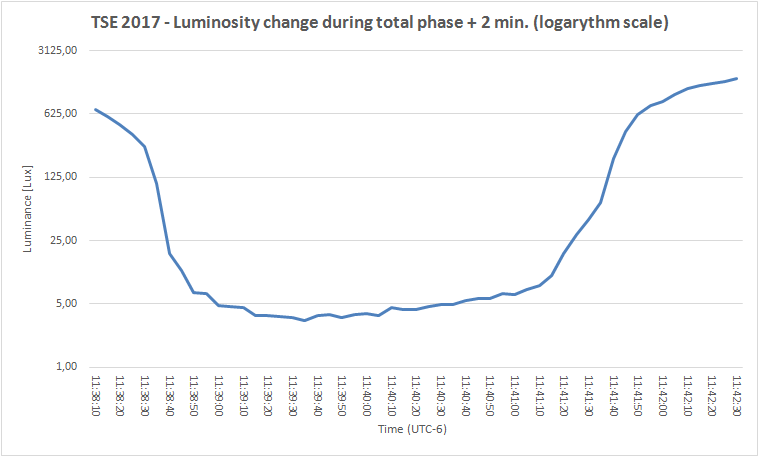 Light level started to drop quicker especially around 11:05, when Moon covered a center of solar disk. The chunks of clouds has been recorded as the separate peaks in the chart (Pic 11, 14). 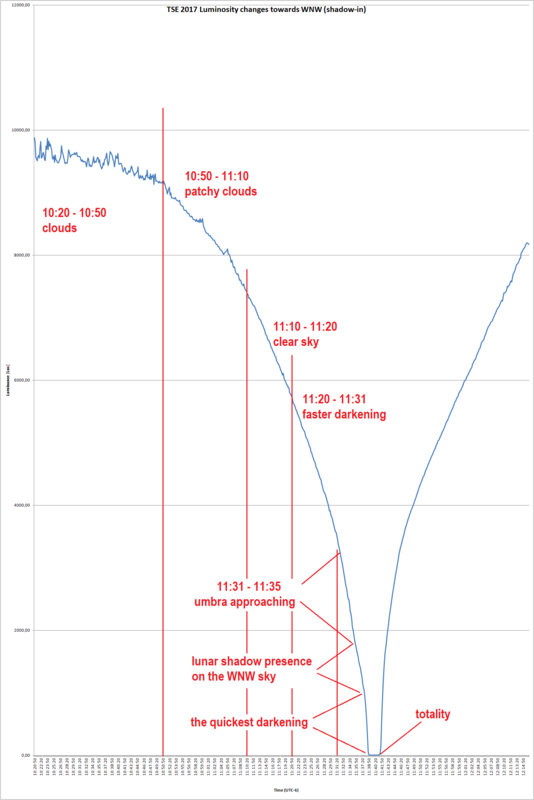 11:10 – 11:20 – After halfway through the partial eclipse clouds moved more southward and dissapeared. The illuminance level was dropping quicker and quicker, however still without a remarkable sign of umbra approaching. 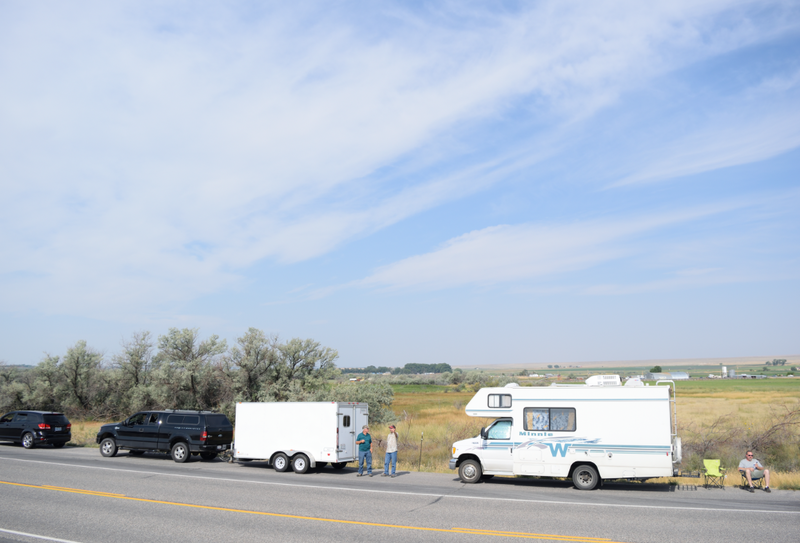 Sky started to be a little bit darker than at the commencement of the observation, though the illuminance distribution across the sky was very similar to non-eclipse conditions. 11:20 – 11:31 – Under the clear sky conditions light level dropped from around 50% to 35%. Darkening started to be discernable on the west. Site started slightly darkening as well. For obscuration 86% shadow cone should be visible at the horizon. However these mathematical assumptions doesn’t cover the reality, where atmospheric molecules and aerosols occur. At the eclipse day nothing discernable was visible in that moment probably because of high haze. 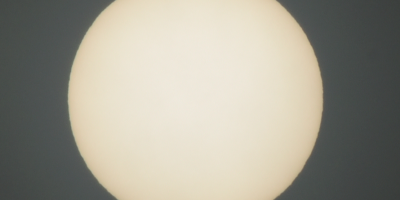 11:31 – 11:35 – When Sun was obscured in 88% sky started darkening faster and faster. This period of time was one of the biggest light level drop on around 15% initial value. This situation arises out of faster sky darkening on shadow-in direction due to umbra approaching (Pic. 15). Pic. 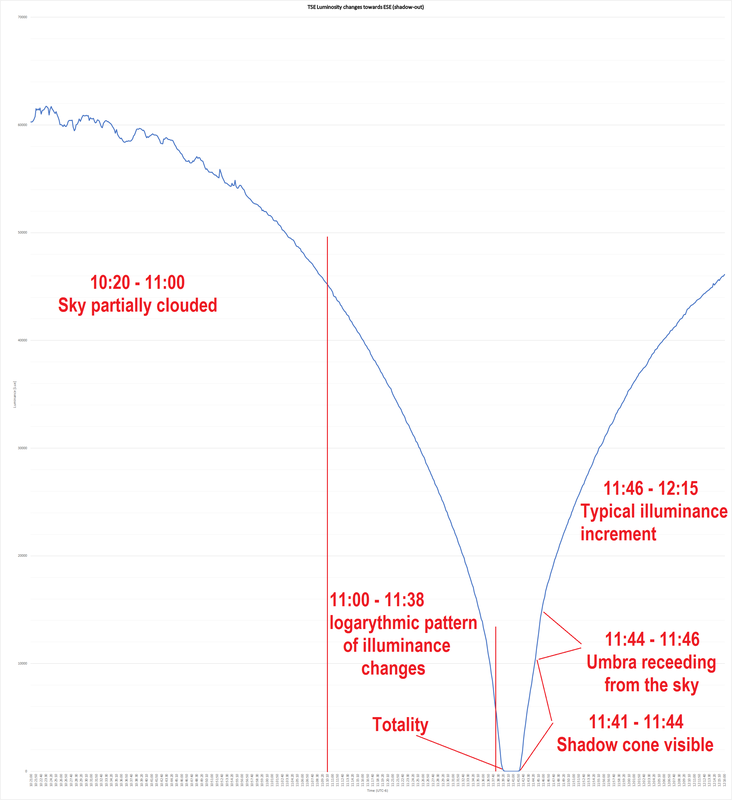 15 Light level changes recorded on WNW (shadow-in) section of sky with rough explanation of significant periods. Click to enlarge. 11:35 – 11:37 – North west sky darkening appeared to be slower. It can be explained by lunar shadow presence, which started to be visible on the sky. The solar obscuration in that moment was from 94,5% to 97,5%. The light level was dropping slightly slower, but still much faster than in the halfway of the partial phase. It can be compared with the 10 minutes earlier period, where Solar disk was obscured in around 85%. 11:37 – 11:38 – This is undeniably the period of the fastest light level dropping with quick changes of sky color also. 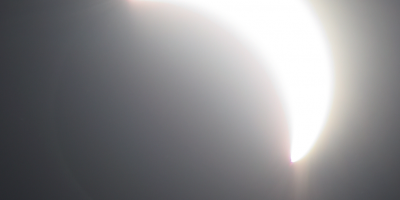 Before 2nd contact – The shadow-in sky reached the lowest level of luminosity around 20 sec before 2nd contact. 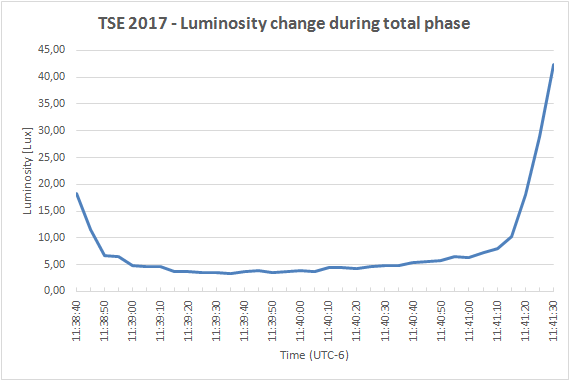 Only within 1 minute since 11:37:50 to 11:38:50 the illuminance level dropped for around 950 Lx, while the biggest decreasing was recorded between 11:38:30 and 11:38:40 for nearly 240 Lx value. 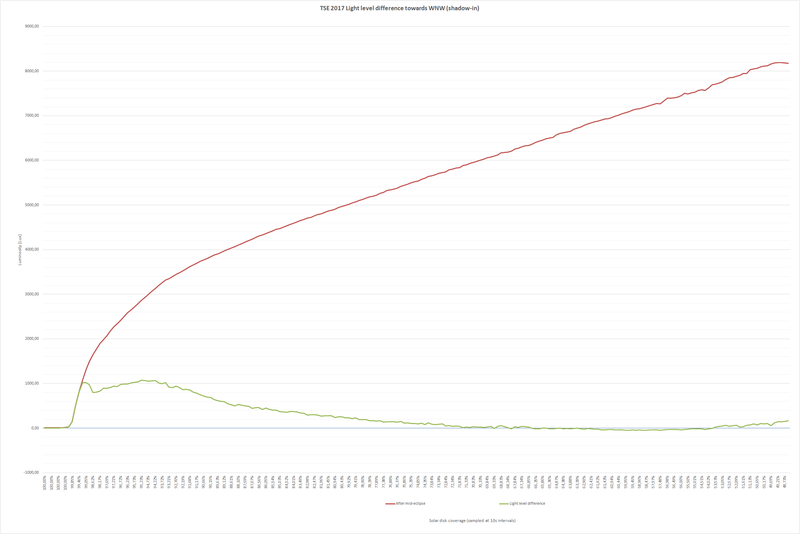 The period of last 20 seconds before 2nd contact featured smallish light level drop from 9 Lx to nearly 5 Lx. An opposite side of umbra became clearly visible since the biggest light level dropping (around 30 sec before totality). When solar obscuration reached a key 99% the shadow-in sky illumination was around 550 Lx. Totality – The lowest value for shadow-in sky was at 20-30 sec after 2nd contact. Thereafter, when umbra proceeded upper on the sky the glow began to be brighter. Around mid-eclipse the north west part of the sky was dark equally to 2nd contact with 4 Lux value. The min. illumination value measured by Samsung Galaxy S5 was 3.56 Lux. A faster illumination growing has been reported around 40 sec before 3rd contact. The north western sky light level grew rapidly in the last 10-15 seconds before 3rd contact, when umbra definitely left this section of sky (Pic. 16 – 18). Pic. 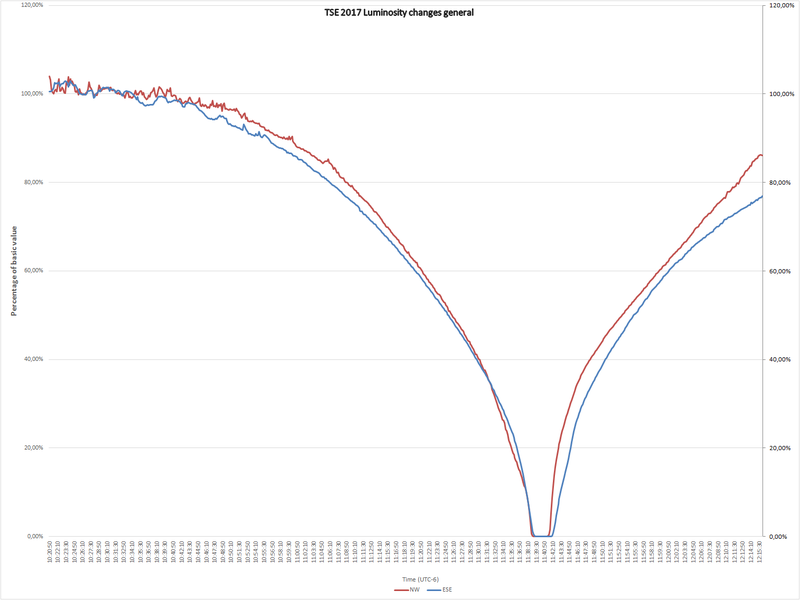 16 – 18 Light level changes towards WNW (shadow-in) direction around totality, where: 16 – totality window; 17 – totality window + 2 min; 18 – totality window + 2 min logarythmic scale. After 3rd contact – The illumination changes looks straighforward and is logarythmic-dependant (Pic. 19,20). Pic. 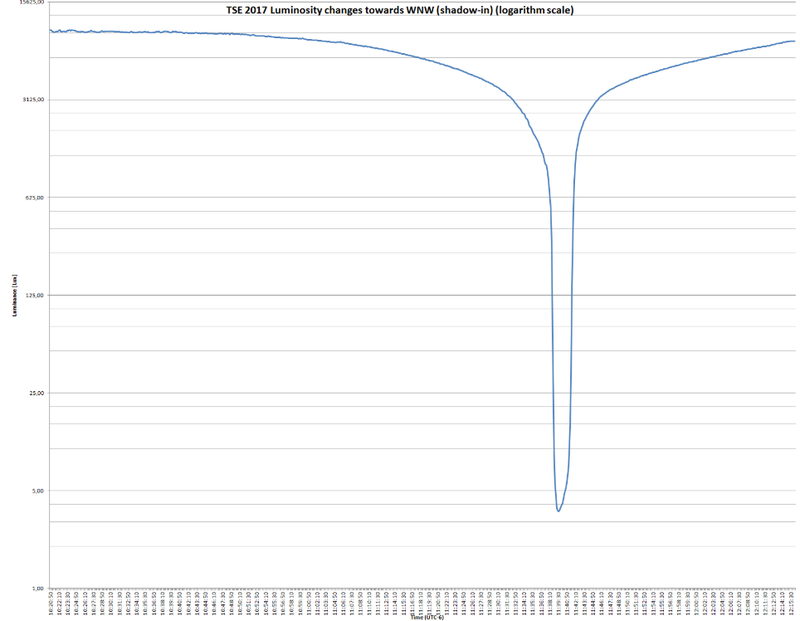 19, 20 – Illumination changes towards WNW (shadow-in) sky between 50% obscuration before and after totality. Click to enlarge. Shadow out direction – Was the section of sky with ESE direction, where umbra receding after the totality. Similarly to shadow-in section here also cirrostratus clouds were presented for around first part of the partial phase (Pic. 23, 24). These clouds moved southward around 10-15 min earlier than in opposite section of sky. Base sky illumination level for the shadow-out direction was around 60000 Lx. Due to cloud presence this value was lifted up to around 61500 Lx. Here I also divided this measurement for shorter periods in order to highlight the most important things, which I spotted. Pic. 23 Cirrostratus cloud coverage towards the ESE (shadow-out) sky at 10:43 UTC-6. Click to enlarge. Pic. 24 Almost clear ESE (shadow-out) section of sky at 11:30 UTC-6. Click to enlarge. 10:20 – 11:00 – The ESE section of sky was partially covered by cirrostratus clouds, which intensified the light scattering. The light level fluctuations were cloud-dependant only with no eclipse-induced changes during this period. Solar disk obscuration at 11am was 41% (Pic. 25, 26). Pic. 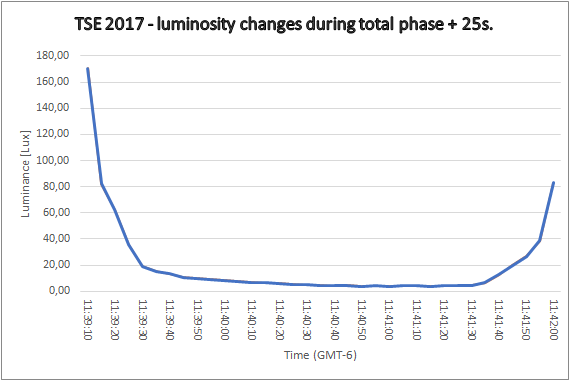 25 Overall luminosity changes towards the shadow-out direction during the 2017 Greatest American Eclipse. Click to enlarge. Pic. 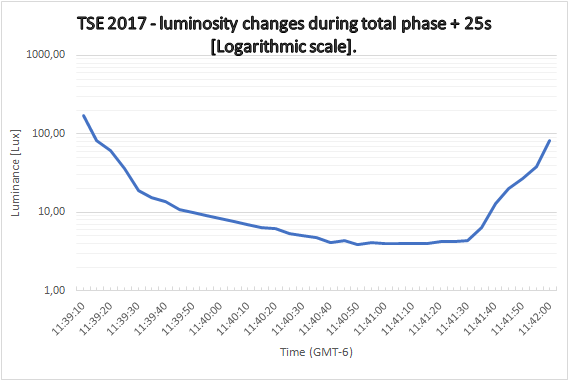 26 Overall luminosity changes towards the shadow-out direction during the 2017 Greatest American Eclipse – logarythmic scale. See an original image here. 11:00 – 11:38 – Illuminance changes behaved likewise logarithmic function do. Light level drop was quicker and quicker as the eclipse progressed. At 11:38:00 the illumination value constituted 10% full daylight in this direction. Before 2nd contact – the light level on the shadow-out part of the sky dropped rapidly, however remained much brighter than in opposite side of sky, because umbra wasn’t cover it. 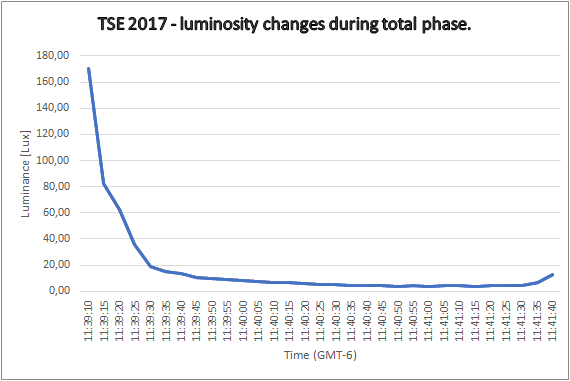 The biggest illumination level dropping has been recorded between 11:38:50 and 11:39:00 from nearly 1700 Lx to around 750 Lx at 10 seconds before totality (Pic. 27). Pic. 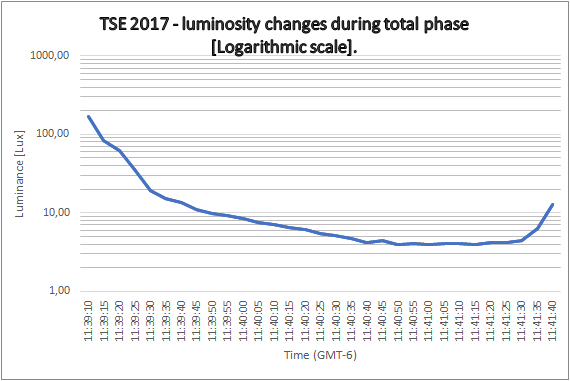 27 Light level changes recorded on ESE (shadow-out) section of sky with rough explanation of significant periods. Click to enlarge. Total phase – Began a huge changes of illuminance level in shadow-in direction. 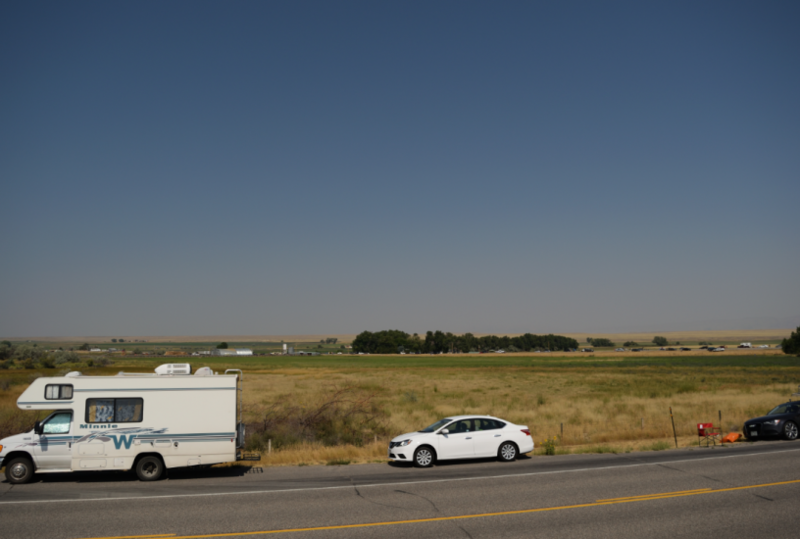 For the first seconds of totality, before lunar shadow covered ESE sky the illuminance dropped from over 270 Lx to 70 Lx giving this section of sky still brighter appearance than on the opposite side. The lowest level of light has been recorded from around 30-40 sec after 2nd contact. At the mid-eclipse the light level was equal to moment of a few seconds after 3rd contact. 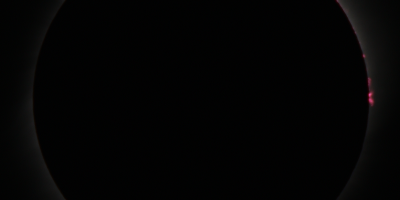 The lowest illumination value centered at 20 sec before 3rd contact with 4 Lx (Pic. 28-31). Pic. 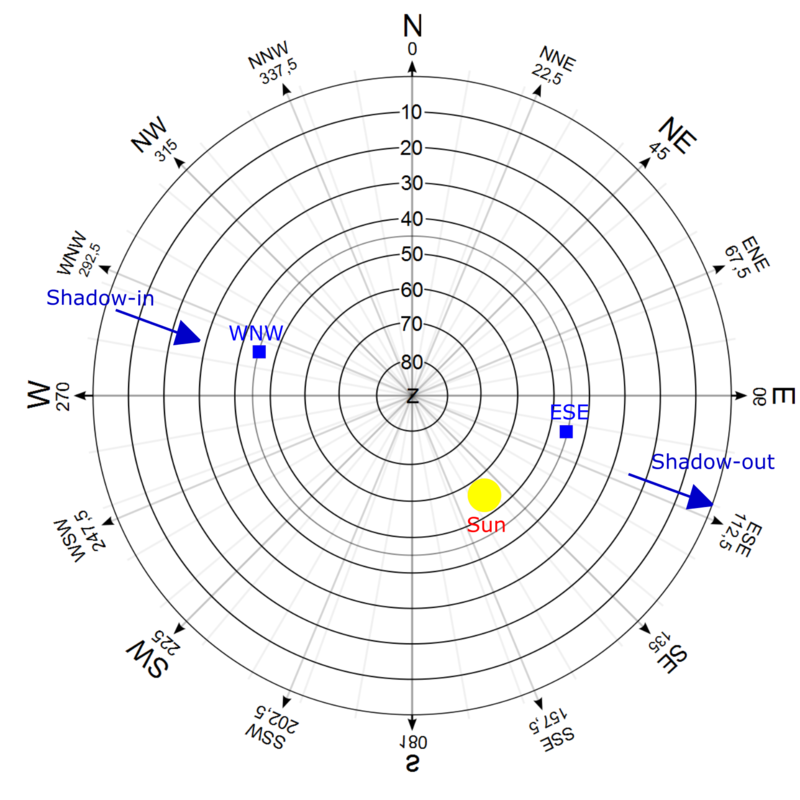 28 – 31 Light level changes towards ESE (shadow-out) direction around totality, where: 28 – totality window; 29 – totality window, logarythmic scale; 30 – totality window + 25s afterwards; 31 – totality window + 25s afterwards, logarythmic scale. 11:41 – 11:44 – Just after 3rd contact the illumination of shadow-out sky increased slowly making a shadow cone clearly visible on the East. 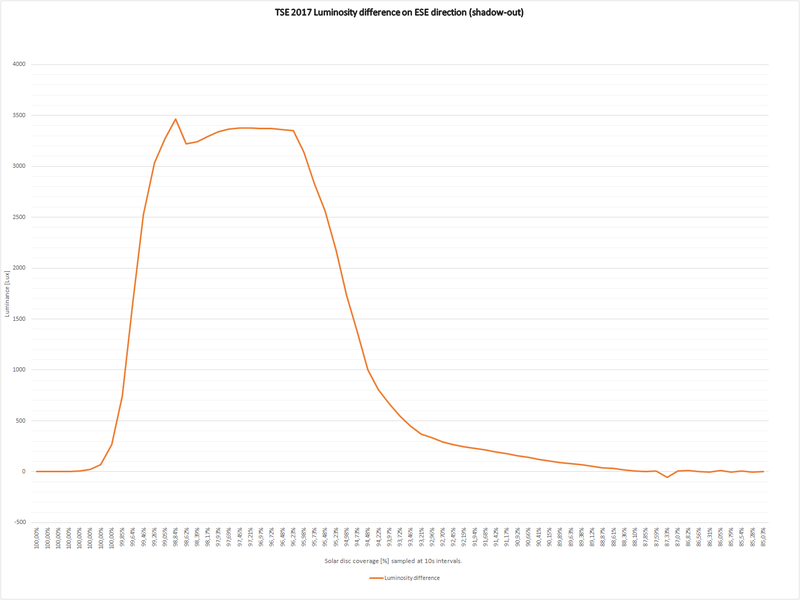 From 40 sec to 1m10sec after totality was the fastest illumination increase from around 480 Lx at 11:42:10 to nearly 2900 Lx at 11:42:40. 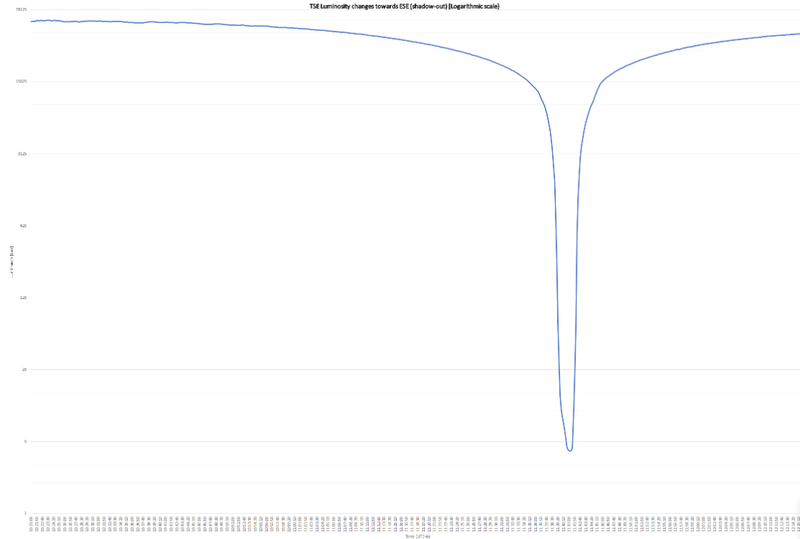 Over the next seconds the light level increased but a bit slower up to 11:44, when solar obscuration was 96,5%. It was the time of considerable influence of umbra on illumination of the eastern part of the sky. The high level of haze scattered forward completely washed out this. The dark cone was visible until around 98% obscuration and afterwards became invisible for the observer. 11:44 – 11:46 – A small acceleration of illumination increase is visible due to umbra receding from sky sphere. At 11:46 the solar obscuration was nearly 94%. This is definitely the last moment, when the shadow presence was set down. 11:46 – 12:15 – Last part of measurement was typical performance (Pic. 32, 33). Pic. 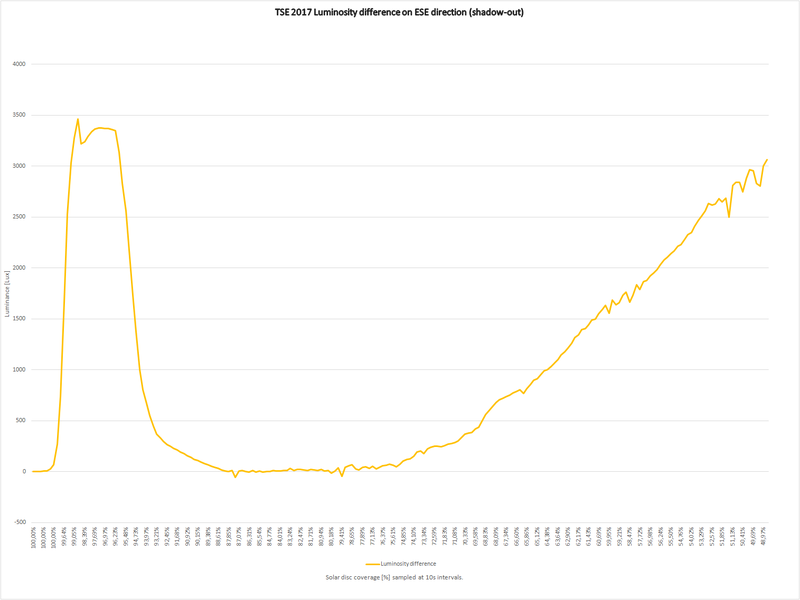 32, 33 Illumination changes towards ESE (shadow-out) sky between 50% obscuration before and after totality. Click to enlarge. Light level grew slower and slower especially near the end of the measurement. Unlike to north western sky the angular distance between Sun and measurement direction was bigger resulting less amount of light reflection (Pic. 34, 35). Pic. 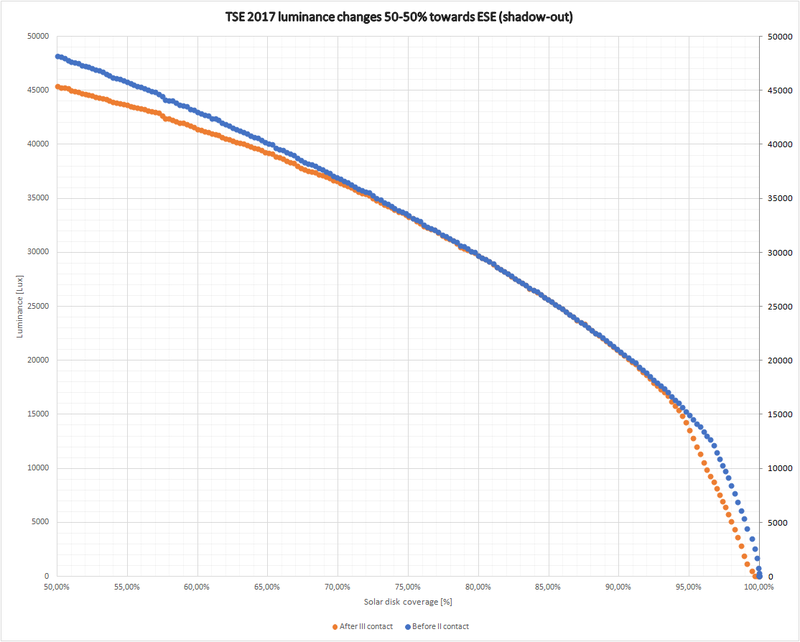 33 Light level difference towards ESE (shadow-out) sky related to the lowest value during totality. Click to elarge. Pic. 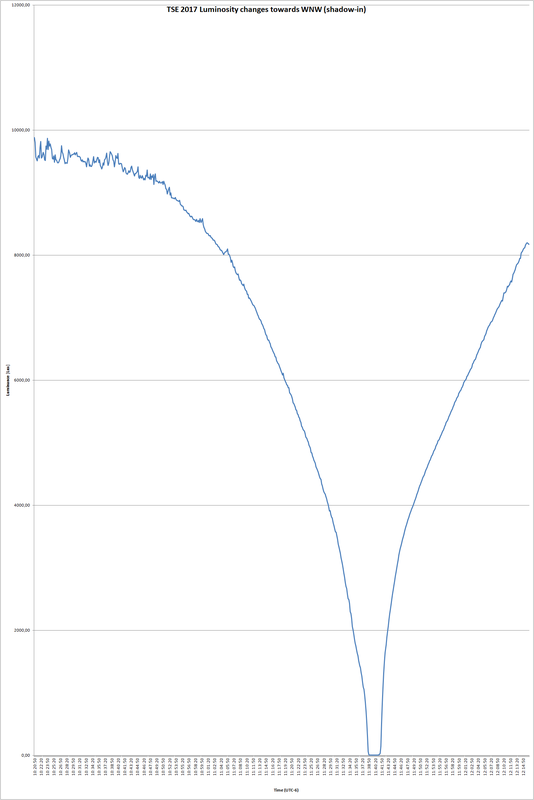 34 Light level difference towards ESE (shadow-out) sky between the totality and the end of measurement. Click to enlarge. Before and after comparison – These measurements differ from each other not only direction but also a character. Analyzing a shadow-in chart solely we can conclude, that darkening of sky started when solar disk was obscured in 72%. These values are minor and become significant for around 80% obscuration, where difference between before and after is more than 200 Lx. For further moments the difference increases constantly up to 88% obscuration, where lunar shadow influence become significant. Pic. 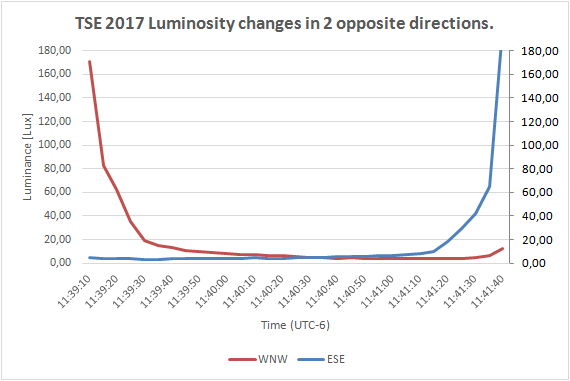 36 Light level difference towards WNW (shadow-in) section of sky during 2017 Greatest American Eclipse. Click to enlarge. The chart (Pic. 36) shows the biggest difference ( over 1000 Lx) for 94% obscuration once umbra appeared on the sky. 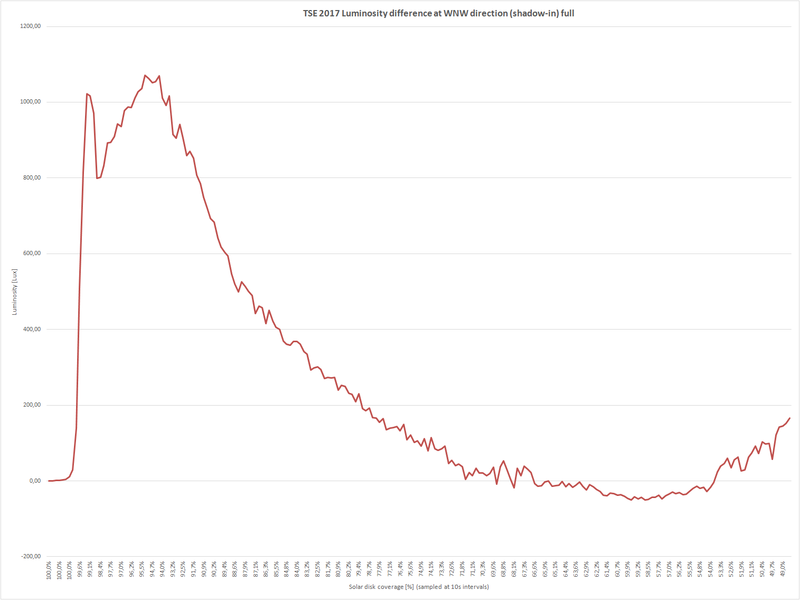 There is another peak for 99,5% obscuration with difference more than 1000 Lx. This is a result of umbra position on the sky just before 2nd contact and just after 3rd contact. At the finish, it’s good to point another before-after difference arising out of sun position change throughout the eclipse. The shadow-in chart looks more clearly than shadow-out due to backward scattering. Unlike to north western sky the umbral impact was much less noticeable on eastern side (Pic. 37). The main culprit was a big aerosols condensation, which caused forward scattering. In the result sky remained bright, stifling any deviations of illumination changes. 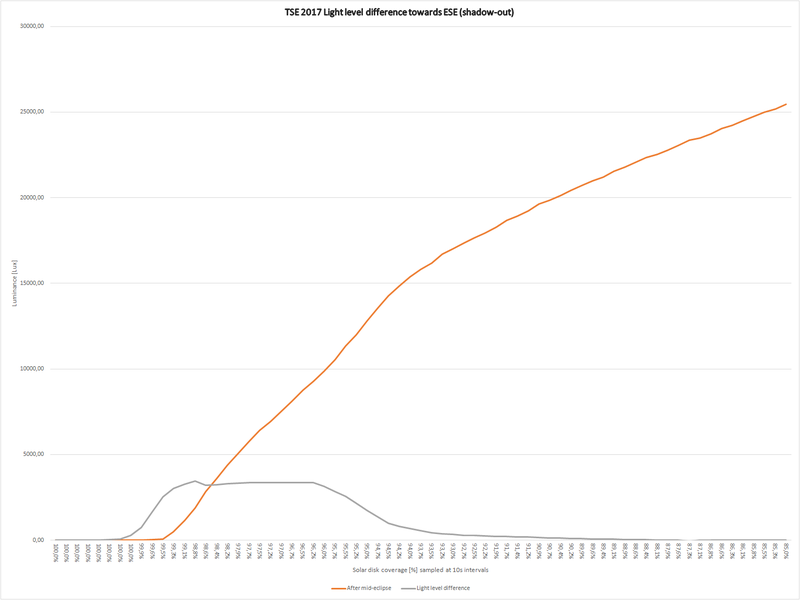 First of all, there is a 1 peak only, where the before-after illuminance difference is almost 3500 Lx. 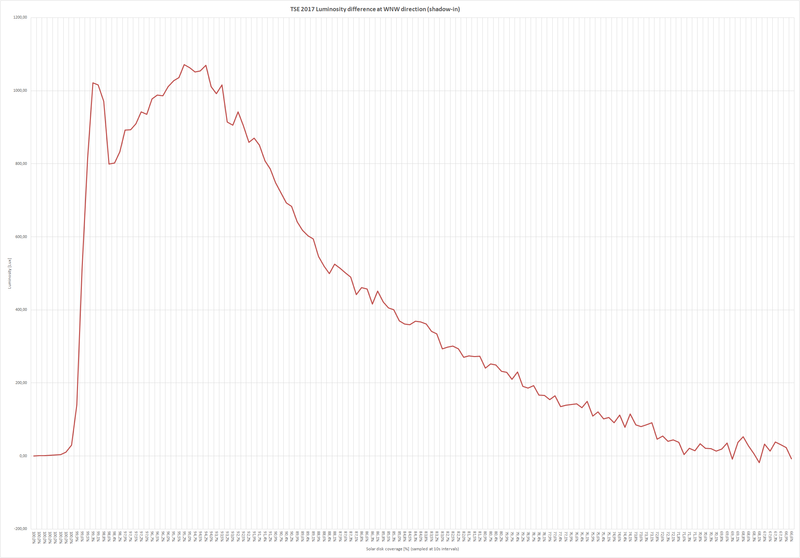 This peak is centered at 99% to 96,5% obscuration. Afterwards falls down rapidly to mere 500 Lx reported around 94% obscuration moment. Any difference between before and after the totality become visible from around 88% when umbral affection on eastern sky is magnificant. Comparing another parts of the eclipse there is no before-after difference in illumination level except the sun position change factor. It is visible in further part of the chart rising up to 3000 Lx at the finish of measurement. Pic. 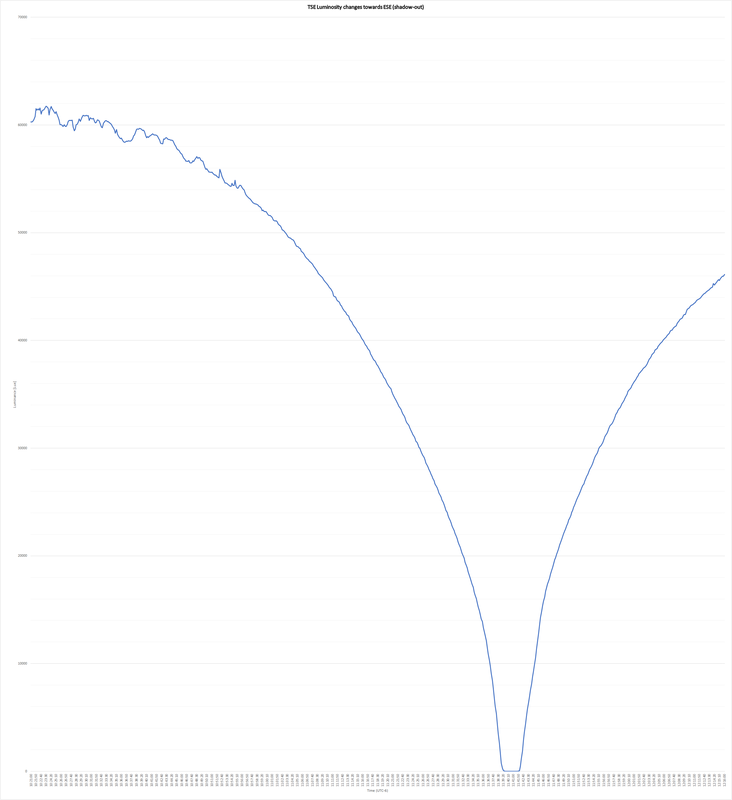 36 Light level difference towards ESE (shadow-out) section of sky during 2017 Greatest American Eclipse. Click to enlarge. General light level comparison – looks also intriguingly. On the contrary of the mathematical assessments the mid-eclipse is not the darkest period of the totality (Pic. 38-41) . It is an effect of different illumination level throughout the whole sky sphere including the twilight glow surrounding lunar shadow. At the beginning the shadow-out sky was much brighter than shadow-in due to solar position on the sky . Pic. 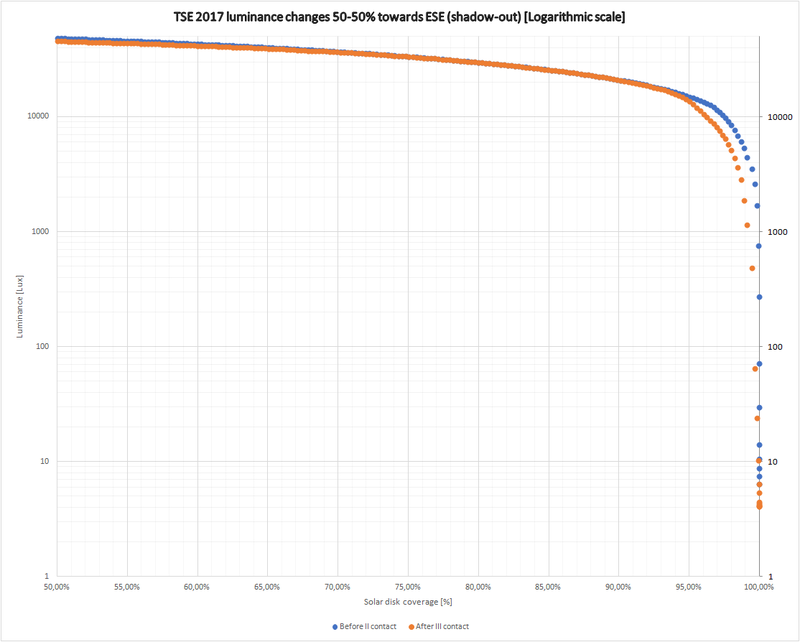 38-39 Luminance changes in 2 oppisite directions (shadow-in and shadow-out) at the total phase of 2017 Great American Eclipse, where: 37 – normal; 38 – logarithmic scale. The darkest moment (a illumination balance in both, and presumably all directions) is to be seen about 10s after mid-eclipse. Pic. 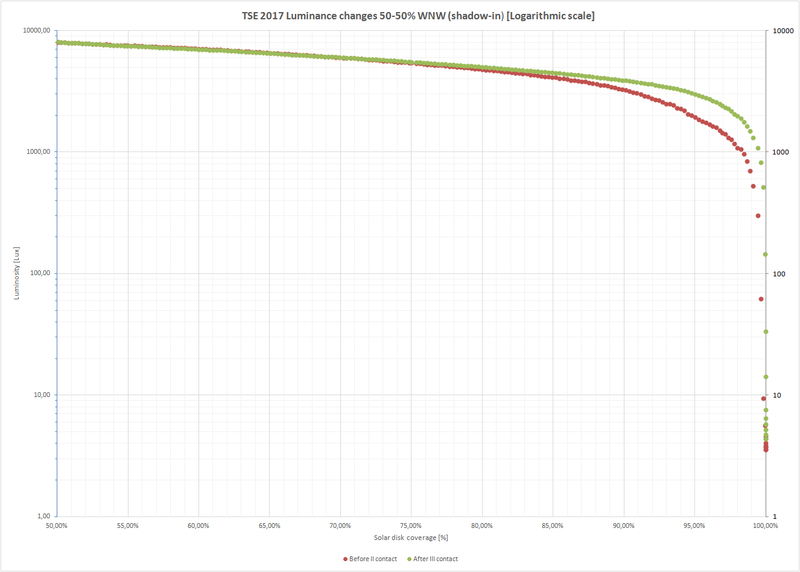 40-41 Luminance changes in 2 oppisite directions (shadow-in and shadow-out) at the 1m40s of total phase (first and last 20s of totality excluded) of 2017 Great American Eclipse, where: 40 – normal; 41 – logarythmic scale. This situation remained invariant until 1min 25 sec of totality basically. Because arleady we know, that mid-eclipse is not the darkest moment of the totality is good to know exactly when the peak of the darkness occurs. 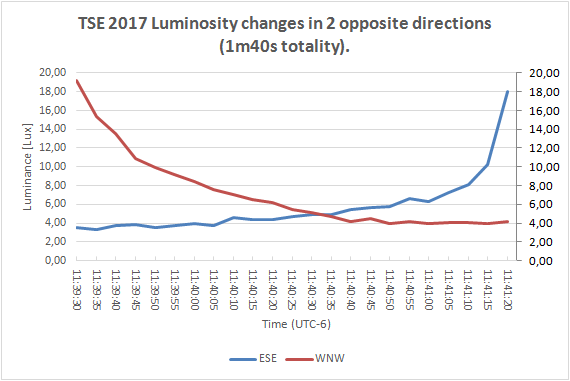 The chart shows minimal value occurrence for both WNW and ESE section of sky, which we can see on the opposite sides of totality. If we know, that the light level of these opposite parts of the sky changes throughout the totality we must find a moment, where these values will be equal. As per the chart this moment occurred at 1m23s after 2nd contact and 11 sec after mid-eclipse, at 1m00s before 3rd contact. The illumination level for both shadow-in and shadow-out sky was about 5 Lx. This value correspond to deep civil twilight. Interesting is also a change just after 3rd contact. For the first 50 seconds after totality the WNW section of sky was brighter than ESE part with visible shadow cone. After 11:42:20 the illuminance level of the shadow-out sky overstepped the light level of shadow-in sky. It was the moment, when solar obscuration was again 99%. At the moment of equaling the value, according to my spartphone was around 1350 Lx. Afterwards the difference of illumination was the same like in 1st partial phase. Pic. 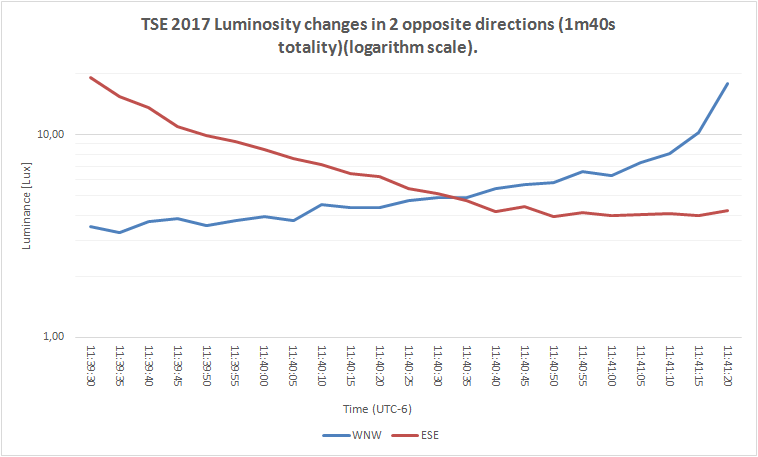 41 Luminosity changes during the 2017 Greatest American Eclipse, where red line shows WNW (shadow-in) direction and blue line shows ESE (shadow-out) direction. Click to enlarge. The light level measurements of the shadow-in and shadow-out sky shown a different scenario of illumination changes. Unlike to solar (or presumably antisolar) direction, where illumination changes usually progress simetrically the other directions show asymetrical illumination changes. Moreover the darkening and brightening phenomena is also haze-dependant, because of forward and backward light scattering influence. The shadow-in sky section represents earlier darkening process with minimal value just after 2nd contact (20-30sec of totality). Thenceforth sky illumination starts to grow as twilight glow approaches. A significat light level changes are to be observed shortly before 3rd contact, when umbra leaving the measured sky section. Afterwards the illuminance increases likewise normal logarithmic function pattern. The shadow-out sky is to be the section, with the latest illumination changes process. On the contrary to shadow-in section of sky the 1st partial phase bring a typical light level drop, which increases as the eclipse progress. A remarkable light level difference can be seen just after 3rd contact, when lunar shadow doesn’t cover the sky yet. Later as totality progress the twilight glow edges away decreasing illumination gradually down to 2m05s of totality (15-20s) before 3rd contact reaching minimal value of 4 Lx. Next the light level starts to increase slowly for around 1 minute and shoot-up rapidly making the shadow-out sky brighter than in opposite side. Main role in illumination changes on this section of sky played a high aerosols concentration causing back light scattering. Next aspect of the observation were the significant moments of the light level changes throughout the eclipse. Is found that the shadow-in sky can start darkening when obscuration higher than 70%, considerating hazy day with backward light scattering conditions. Probably under fair weather condition this effect can be visible a little bit earlier. The umbra presence in the atmosphere should be visible by 86% obscuration, but it is impossible due to atmospheric particles. By the 88% obscuration observer can spot a significant darkening of the sky when backward light scattering takes place. A real presence of umbra on the sky sphere has been reported at 94% obscuration for shadow-in sky and 96,5% for shadow-out sky, where it was much less visible. I based it on the biggest before-after illumination difference recorded and shown on the charts. A forward light scattering was playing a main role on the shadow-out sky, where the umbral presence was drown out much quicker. By the 93,5% obscuration light level changes were the same in before-after relation. The darkest moment occured 11s after mid-eclipse. This lag was an effect of solar position on the sky (53deg above S horizon), which interacted with overall sky ilumination level making it slightly various across the sky sphere. Another fact, that has been observed and measured during this solar eclipse was a sky illumination changes due to solar position changes. As the Sun moved westwards throughout the eclipse measurements window the shadow-in sky became brighter, whereas a shadow-out sky darker than at the beginning. This kind of measurement can be applied both for deep partial and any kind of annular eclipse. Despite of simplicity of smartphone Lux measures app with a big deviation value all phenomenas associated with umbral impact of the sky illumination remained visible. These results will be analogous for total eclipses with similar length, however the subject remains open for shorter and especially the longest periods of totality as well as different moment of the day, when this celestial event occurs. Mollmann K.P., Vollmer M., 2006, Measurements and predictions of the illuminance during a solar eclipse, (in:) European Journal of Physics, vol. 26, p.1299-1314. Vollmer M., 2009, Sonnen- und Mondﬁnsternisse: Beobachtungen, Messungen und Quantitative Modelle, (in:) Praxis der Naturwissenschaften – Physik in der Schule, vol. 58, s. 38-44.